While I’m not a fan of the heat of summer I do love the flavours of summer. The shops are starting to have peaches and other stone fruits which means light delicious meals and desserts. It’s been a busy week but I wanted to make a nice meal for my husband and myself last night. Peaches sparked an idea and jalapeño is one of my husband’s favourite hot peppers. A match is made! I prepped the corn by soaking the ears before grilling and dusted the steak with chili powder and cumin. 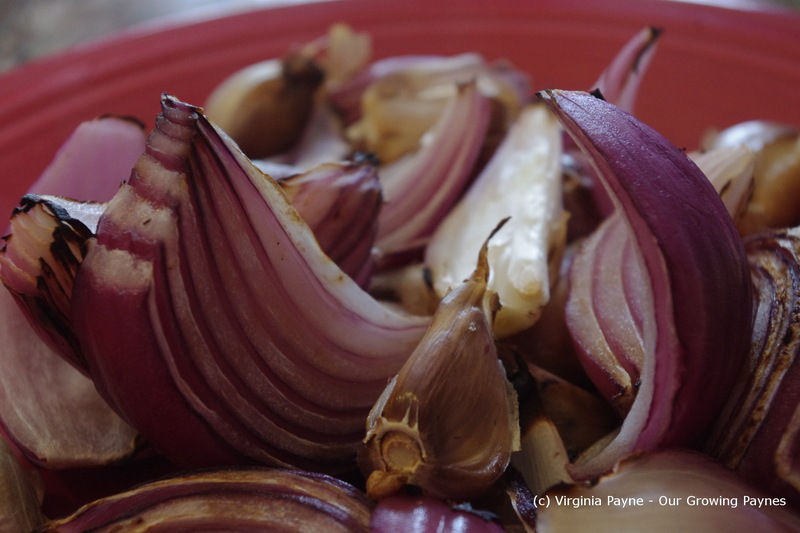 Slice up a quarter red onion. Begin to sweat them in a hot skillet with olive oil. Slice the jalapeño. I removed the seeds because sometimes the pepper can be very hot and I didn’t want to overwhelm the peach. I also started with half a pepper. Sauté the pepper and onion for a few minutes. I sliced up three small peaches. You can tell it’s the beginning of the season as the peaches were quite small. Add the peaches. Cook for a few minutes. Fire up the grill to start grilling the corn. I grill the corn, unshucked, 5 minutes a side. Season the peach with chili pepper and cumin. Add a splash of lime juice. After tasting I added the rest of the pepper as there wasn’t much heat. Grill the steak to the desired doneness. We like ours on the rare side. Once cooked, rest the steak for a few minutes then slice. Shuck the corn. Place the steak on salad greens and spoon the peach over the steak. 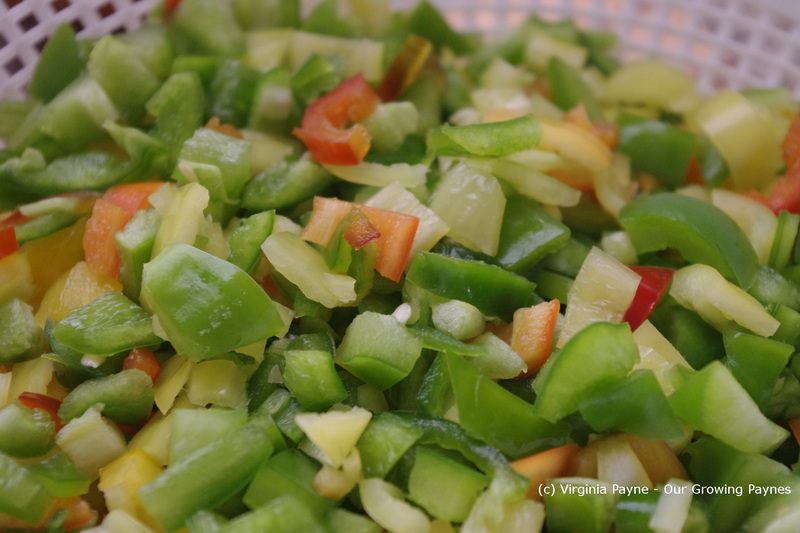 Jalapeno Relish – Think It’s Finally Hot Enough! Before we rolled up our sleeves and tackled the house we had to contend with frost warnings. After a flurry of pepper picking I had to do something with them so they didn’t go to waste. 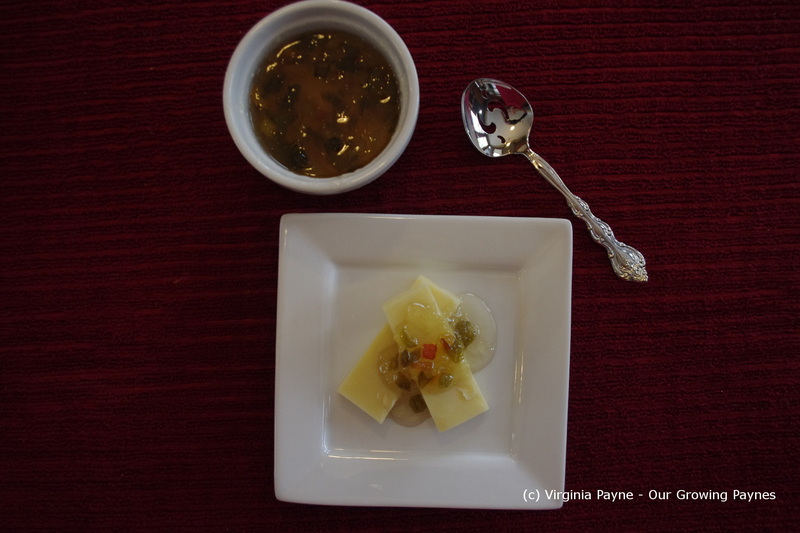 Because we have a lot of hot peppers, jalapeno relish sounded like a good idea. Not only was a it a good idea it is a really quick relish to make when you list is long. In fact it is faster to do it than this post! I followed this recipe for the most part to make my relish. This is all done in the food processor. 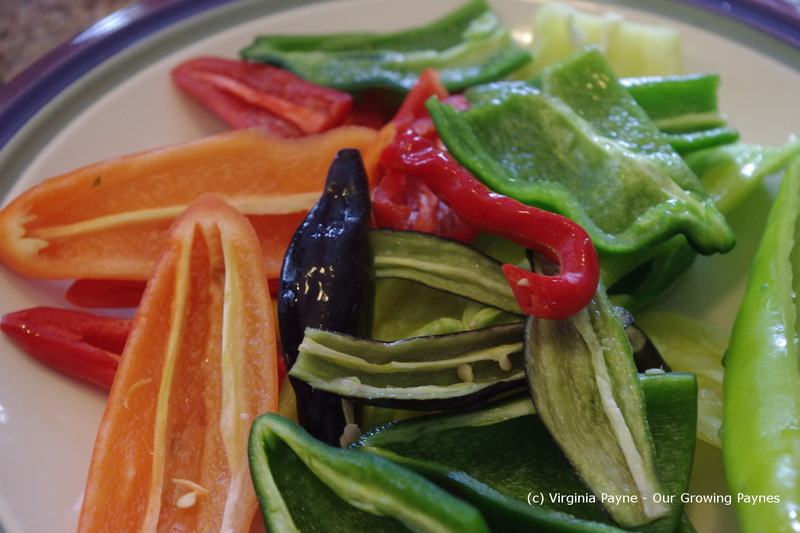 I sliced about 12 jalapenos and 1-2 Ring O Fire peppers. I figured I was going to make this really hot for my husband. I keep trying with the heat but while he enjoys the hot stuff I make it doesn’t seem to blow him away like it does me. He likes things spicy! Add 4-5 cloves of garlic, half a small onion, 1/4 tsp cumin, 1 tsp sugar, 1 tsp sea salt, 1/3 cup apple cider vinegar, and a large handful of cilantro. Pulse away until you get the consistency you want. Freeze or can the extra relish. And yes this blew him away. 🙂 Finally! It’s hot enough to use sparingly on dishes. It was high time I tried making my own ketchup. Given that we are currently being overwhelmed with fresh tomatoes we had enough to make some. With the experiment using the Epsom salt for the tomatoes this year I have some results. We have a crazy amount of tomatoes this year and very little cracking which has been an issue in the previous years. On the flip side the fruit are ripening in a weird way. Not sure if it’s because the season is cooler than normal. They fall off before they are ripe and then they are going off a lot faster so we are struggling to keep up with it. I will try this again next year to see what is what. I did a bit of research on ketchup recipes and figured I could come up with my own recipe without too much trouble. I estimate we had about 6-7 pounds of tomatoes which we chopped and added it to a large pot. 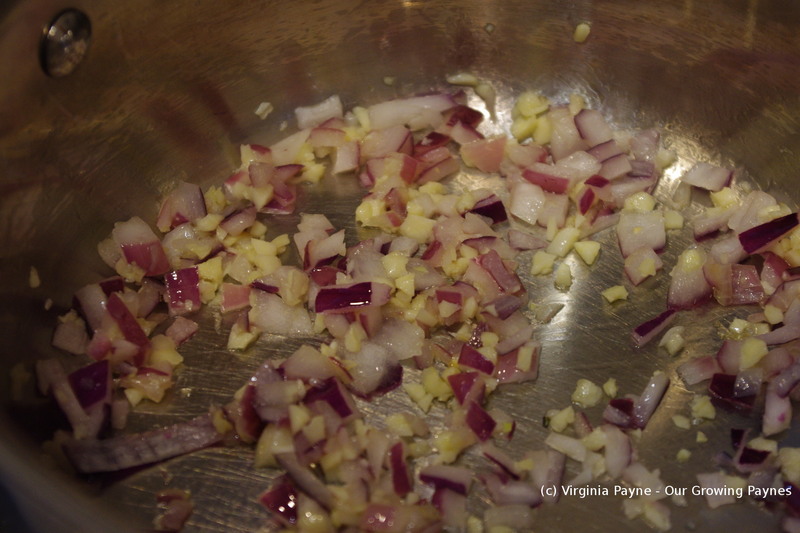 In addition chop 1 large red onion, 1 medium white onion, a jalapeno, 2 Ring O Fire peppers, and 2 cloves of garlic. Add a couple of tablespoons of olive oil, 2-3 tsps of sea salt, 1-2 tsps of pepper, and a handful of celery leaves. Bring to a simmer stirring well. Simmer until the sauce reduces by about a third. Let it cool and then use a hand blender to process the ingredients. Press the sauce through a sieve to remove the remaining solids into a clean pot. Bring back up to a simmer. Add a cup of red wine vinegar and 3/4 cup of brown sugar. Simmer until the ketchup is reduce by another 1/3 and is the consistency you want. I like it on the thicker side so it reduced a bit more than a 1/3. If you want it thicker add a bit more brown sugar. Can in sterilised jars and process for 10 minutes. I am really pleased how this came out. Certainly makes me want to whip up some burgers and fries! Maybe some onion rings. 🙂 This has a lovely heat finish to it. I Love the Colours of Summer Food! We were spoilt when we were in England with the summer weather. My kind of summer weather where I don’t feel like I’m about to melt and I start to wonder if there is room in the fridge for me. My husband heard a report on the BBC talking about how muggy the weather was. Ha! I’ll take their version over the mugginess we get here any day of the week. It was fabulous sleeping weather. Right now there is a wall of humidity waiting for us just outside the door. Ugh. Thank goodness for A/C. Of course this time of year comfort food is right out the window. At least the heavy stick to your ribs kind. Yesterday I reached back to one of my earlier cookbooks that I got when I moved out on my own to make a corn dish that is packed with flavour but is light and easy to make. I drew inspiration from “Skillet Suppers” by Andrea Chesman. It was published back in 1994. I haven’t opened it in years so it was time to dust it off. 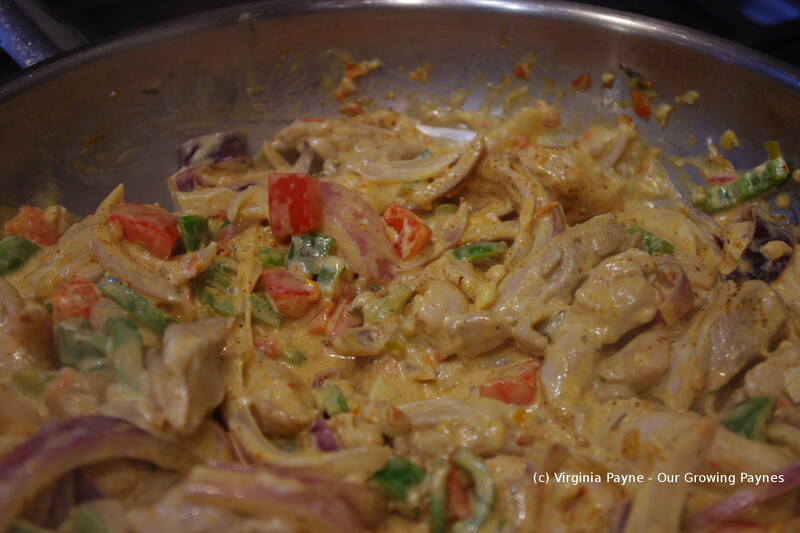 This is my version of their Cajun Macque Choux. Their version has evaporated milk and prawns. I took out the milk and replaced the prawns with chicken. I also love this dish for all the bright colours of the ingredients. This is a one skillet meal which makes for very easy clean up. Chop about 5-6 slices of streaky bacon depending on how thick they are and cube a breast of chicken. Start cooking the bacon in the skillet to render the fat. Once it’s about half way cooked add the chicken in. Thinly slice a quarter of a red onion and add it to the bacon and chicken. 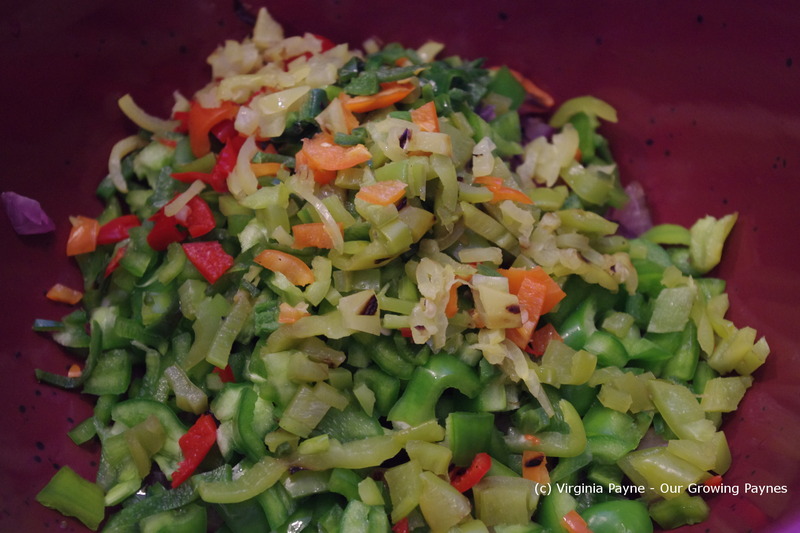 When the onion begins to soften add the chopped jalapeno and a cup of chopped pepper. Any colour you wish. Stir well as this cooks. 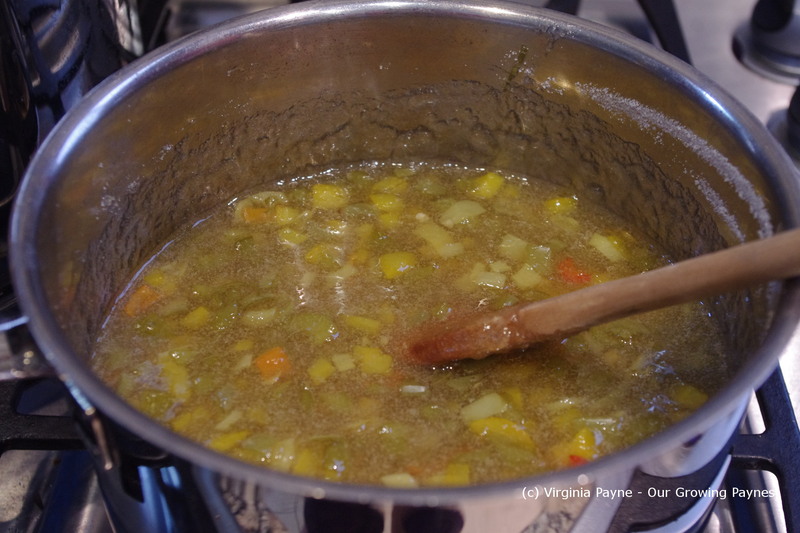 Add about 10oz of frozen corn, 1/3 – 1/2 cup of chopped scallion, and a teaspoon or so of fresh thyme. Have this on medium heat. Once the corn is about half way cooked add a handful of chopped fresh basil and a chopped tomato. I used about a cups worth of tomato. Season with salt, black pepper, and white pepper. Stir well and cook until the corn and chicken are finished. Because of my cold I’ve been trying to get as much spicy things into me as I can. Though not always with success. I tried making our spicy stir fry, which is normally a success, but not that night. The jalapenos were mild and I screwed up the rice noodles. So last night I wanted to redeem myself with something that actually had a bit of heat! 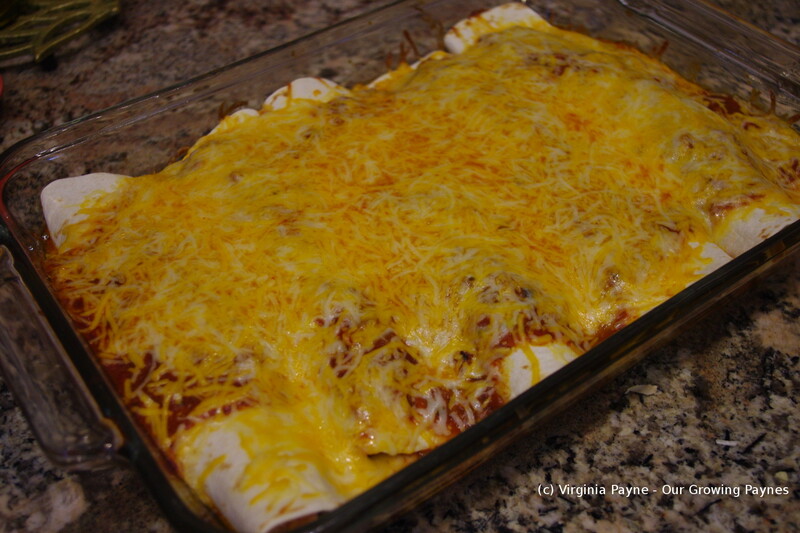 My kids wanted Mexican for dinner so I decided to make homemade enchiladas and sauce. 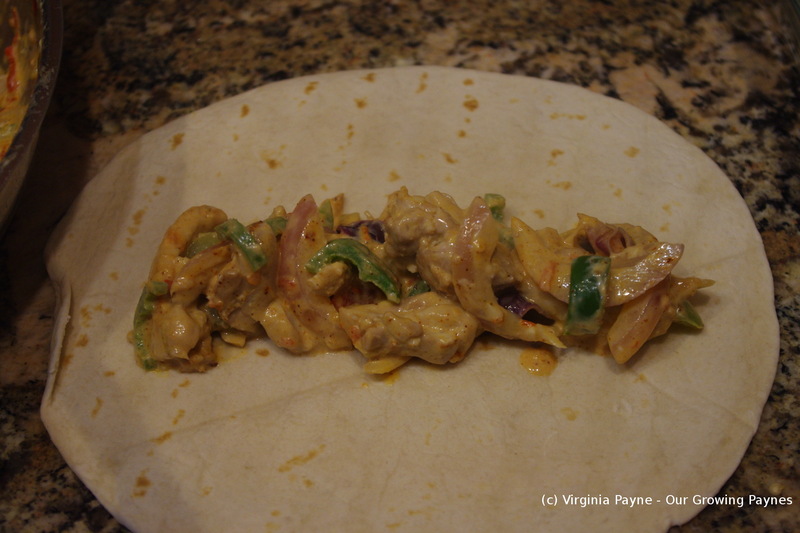 This is a very versatile dish as you make it your own. Particularly in terms of how much heat you want in your dish. So if you want to knock your socks off you can! Pre heat the oven for 375F/190C. 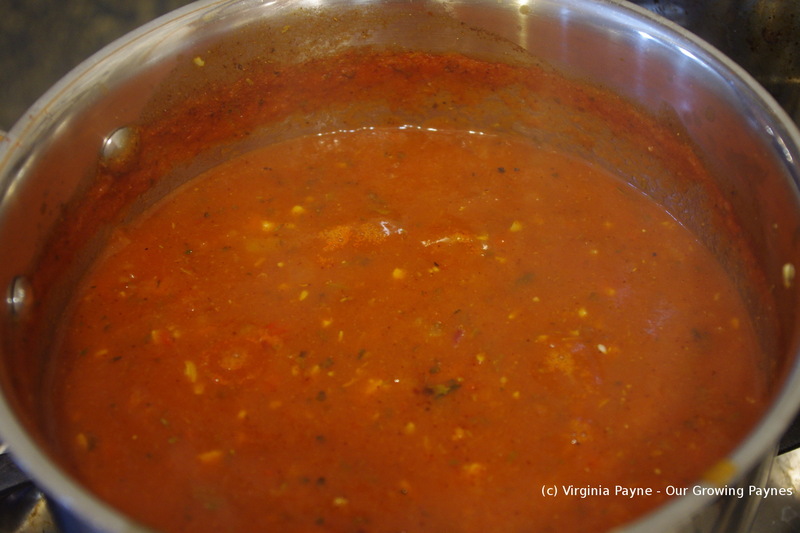 Make the enchilada sauce first so it can simmer to give it time for the flavours to develop. Mince 2-3 cloves of garlic and about 1/2 a cup of onion and saute in olive oil. Once they’ve softened a bit add a 14oz can of tomato sauce, 3/4 cups of water, 1/3 cup of salsa, dried oregano, dried basil, chili powder, ground cumin, lime juice, red pepper flakes, adobe seasoning, and salt and pepper. I’m not giving measurements for the seasoning as you can tailor it to your tastes. The main bit is not to have an overpowering taste of tomato. You want all the flavours to come through. Let this simmer while you prep the enchiladas. 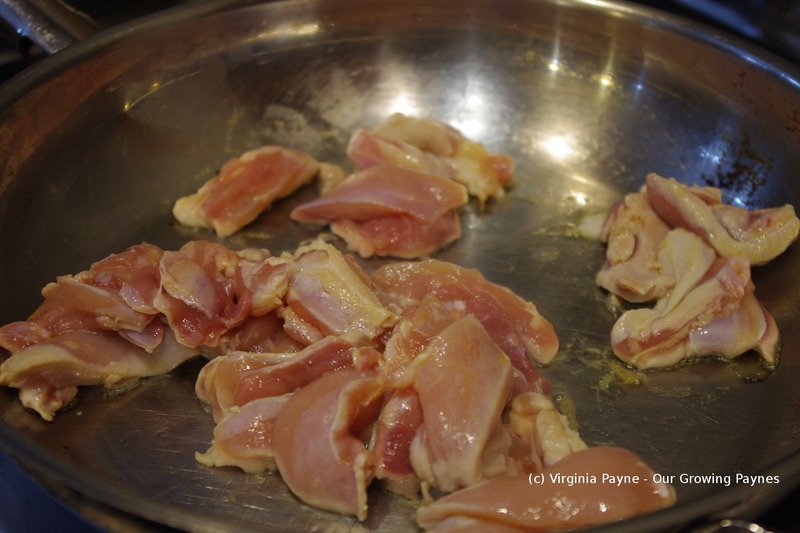 I found chicken thighs to use for this dish as they are cheaper and have a lot of flavour. I cut them into strips and started to brown them in olive oil. 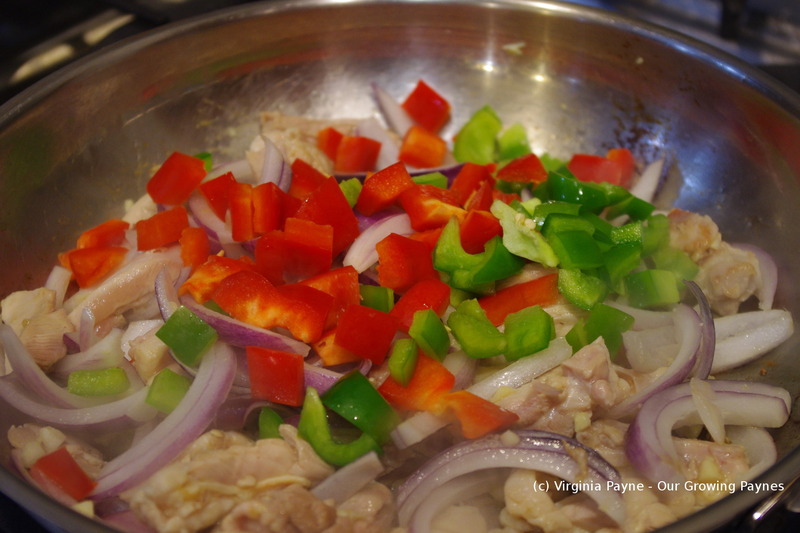 Add a bit of lime juice along with chili powder and cumin as well as about 1/3 cup – 1/2 cup of salsa. 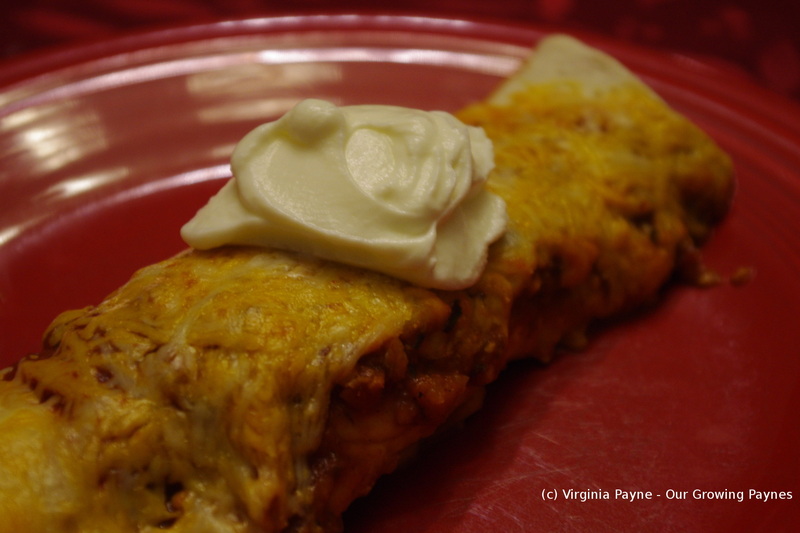 I wanted to try a creamy enchilada so I added about 4oz of low fat cream cheese. Spoon the mixture into the middle of the tortillas. 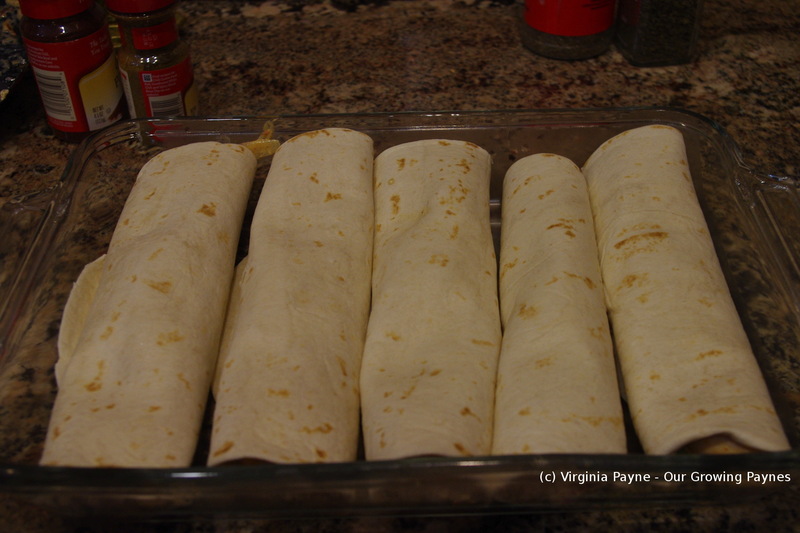 Roll and place in the seam down in the baking dish. 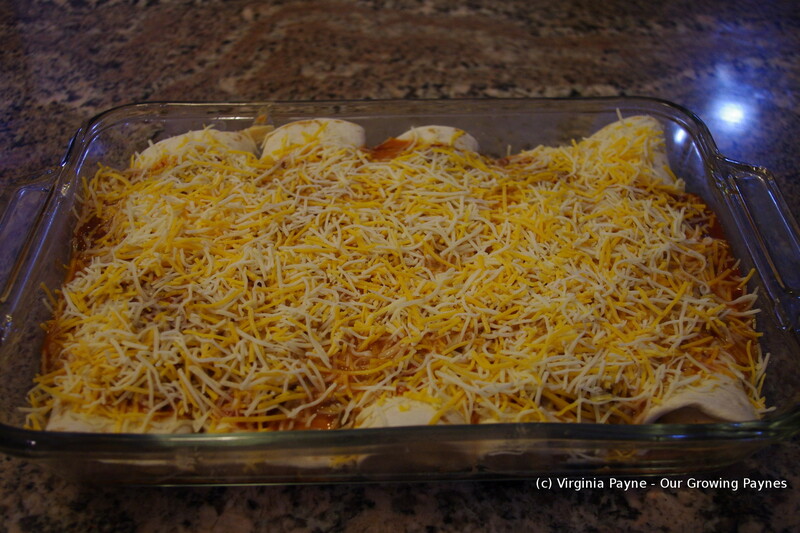 Pour the enchilada sauce over the enchiladas and cover with shredded cheese. Bake until the cheese melts and starts to brown a bit. It is ready to serve immediately. For the table put out sour cream, salsa, and jalapeno to compliment the dish. We had another round of harvesting a ton of tomatoes so it was the salsa’s turn to be made. 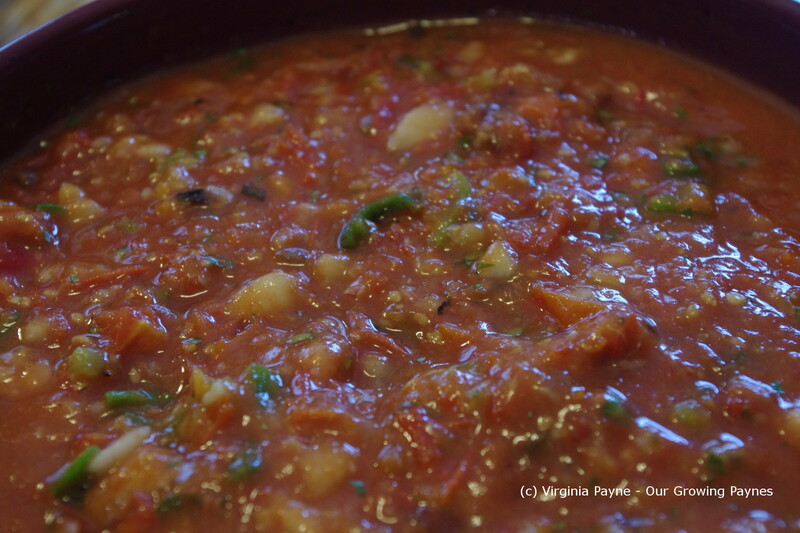 We first made my husband’s salsa which is a raw salsa and great for a quick dish before heading to a party. To make his we processed tomatoes, sweet peppers, hot peppers, onion and peaches. It is seasoned with salt, pepper, lime juice, and cilantro. For his we used the grinder on the Kitchen Aid then we drained the salsa a bit to thicken it. It is always a hit whenever we bring it to BBQs. Something about fresh out of the garden veg to make this so tasty. That only took a portion of the harvested tomatoes so I wanted to try a new salsa with similiar veg but a different technique. Richard from REMCooks posted this salsa and I thought I would take his technique and apply it to the ingredients I wanted to use. It is not a hard salsa to make but given the volume of veg I had it took me all afternoon as I had to stage various ingredients and process them in stages but I got there in the end! 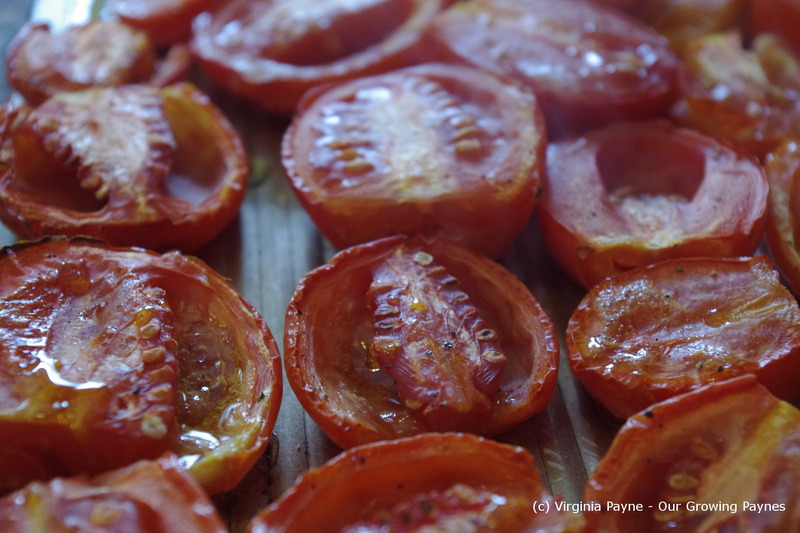 I started with the tomatoes first and instead of roasting them on the grill I had to do it in the oven as the cookie sheet was much bigger than my grill pan and even then I had to do two batches. I heated the oven to 350F/ 177C. 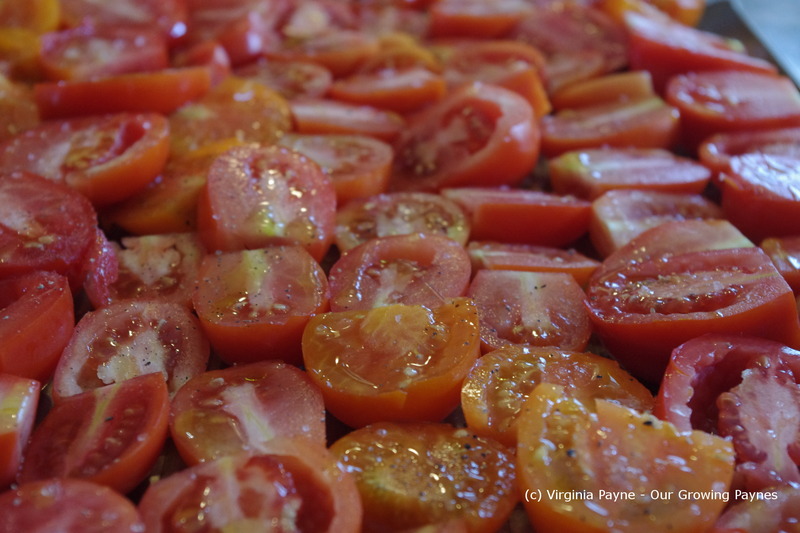 On the large cookie sheet I did one layer of tomatoes and drizzled them with a bit of olive oil, salt, and pepper. 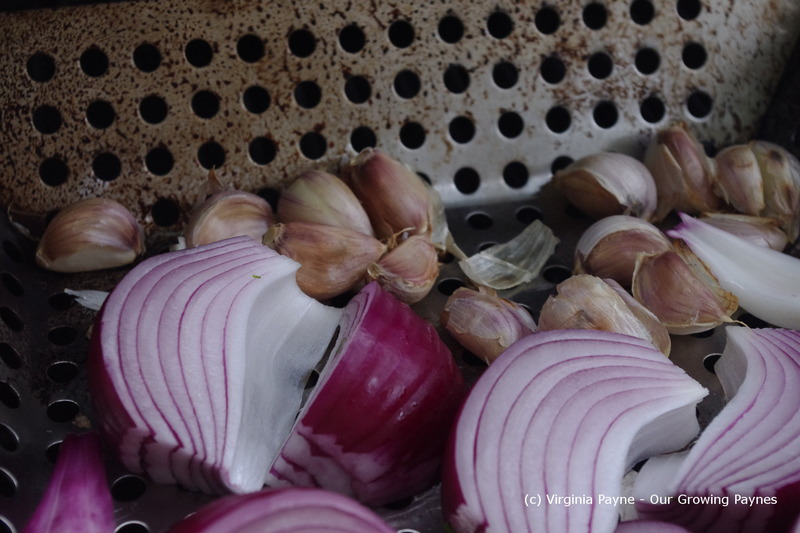 I like Richard’s tip about roasting the garlic in the skins on the grill so I gave that a shot. Per his advice I started those first then about halfway through I added the onion. For this I used one very large red onion. Remove and set aside. 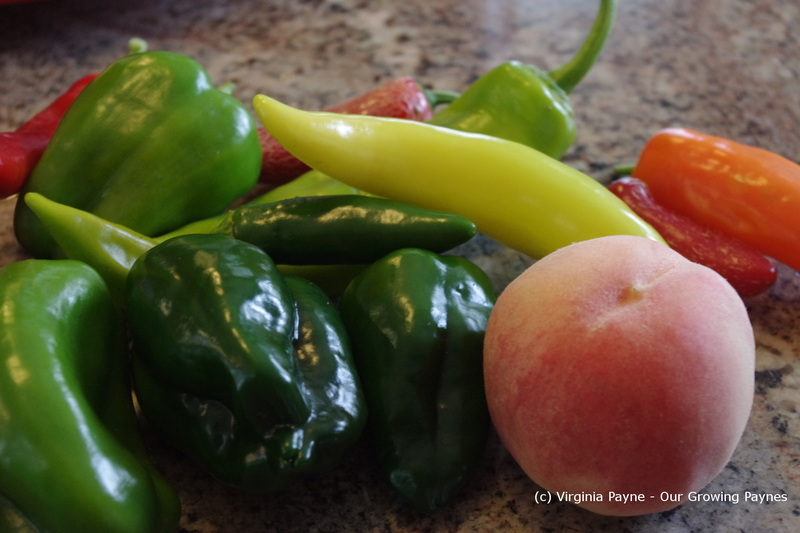 While the onions and garlic were cooking I gathered the peppers from the garden and the peaches from the co-op. Found some nice white peaches. 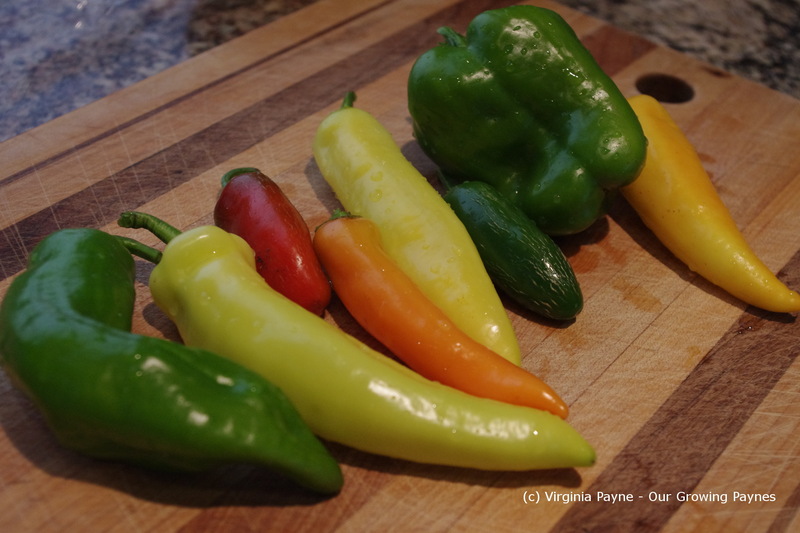 The peppers I used were cayenne from the co-op and hot wax, jalapeno, poblano, and sweet peppers from the garden. 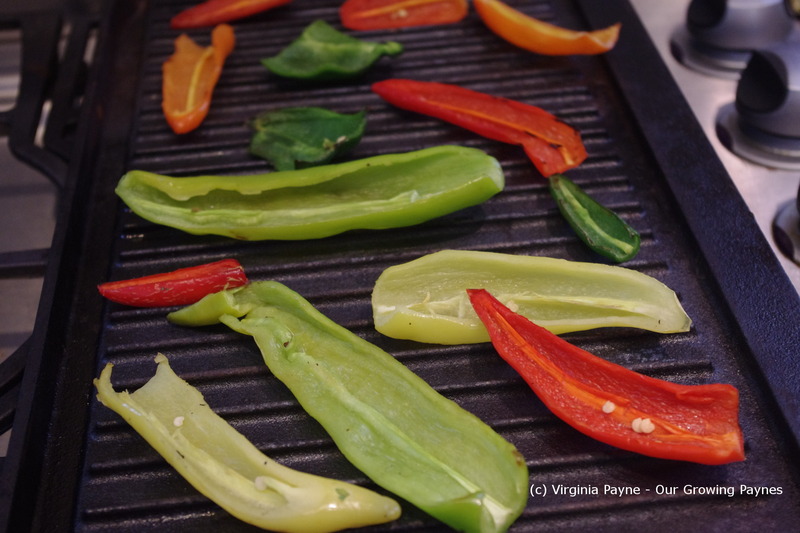 I sliced the hot peppers lengthwise and cleaned them to prep them for the grill. While I was roasting them on the grill I got out a large bowl and chopped the onion and put that in the bowl. I also chopped up the sweet peppers and put them in the bowl. I left them uncooked for a bit of texture. 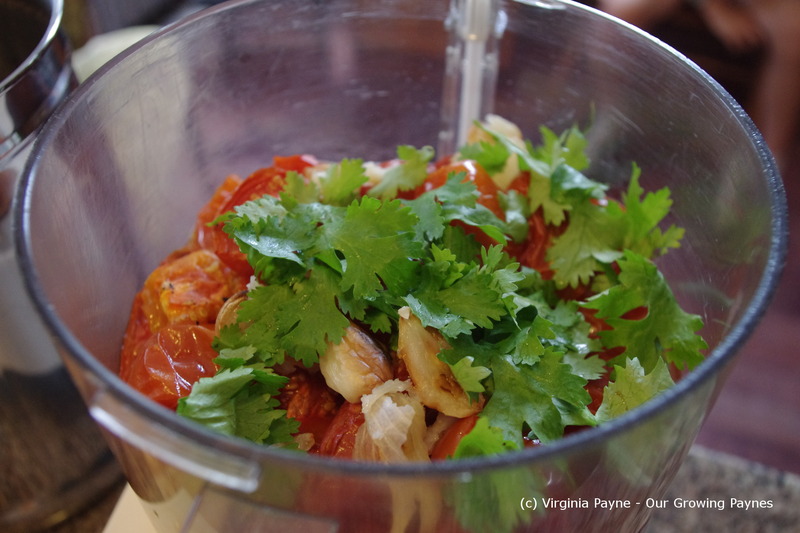 I then put together the food processor and put in the first batch of tomatoes, half the garlic (skins removed), a handful of cilantro and set aside for the peaches and hot peppers. When I went out to check on the peppers I discovered I ran out of gas. My first thought this was now going to be a two day process but my daughter reminded me the cast iron griddle has a grill side to it. Thank goodness! I got that heated up and brought the peppers in to finish. Once they were done I took the smaller hot peppers and added them to the food processor and then chopped the rest of the larger hot peppers and added those to the bowl. The trick is to have a bit of heat but make it so most people can eat it. I wanted the hotter peppers to be evenly distributed through the salsa. The last ingredient to grill was the peach. 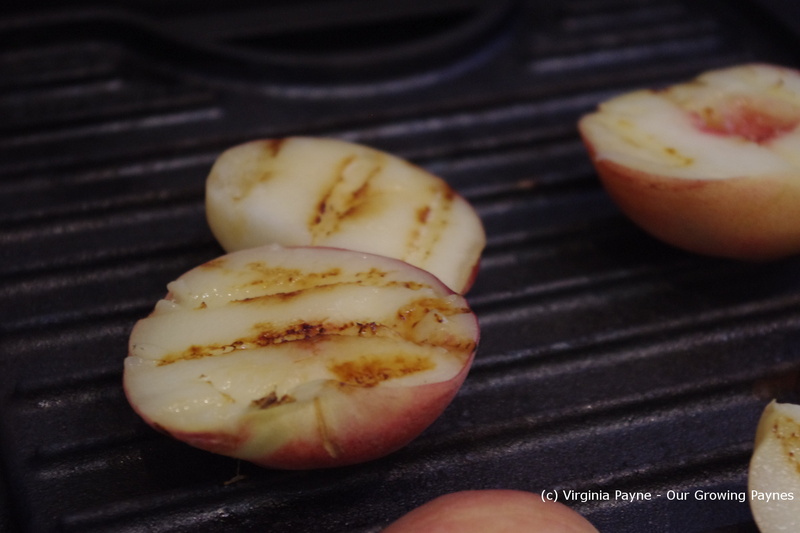 I love grilled peaches and will have to make some as a dessert as my daughter requested some soon. They impart a lovely flavour. 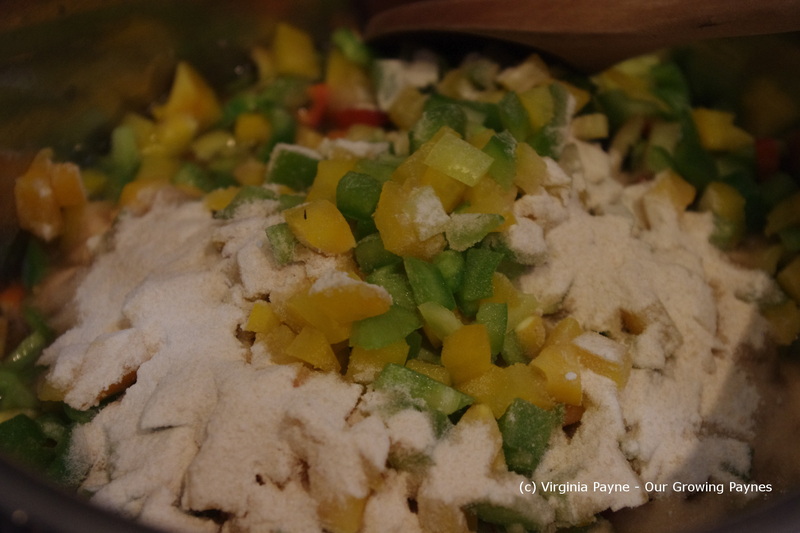 Add half to the to the food processor and process until it’s a bit chunky. Repeat with the second half of the ingredients and add all to the bowl. Then add lime juice to taste. If it needs a bit more salt add that as well and then stir it all together. 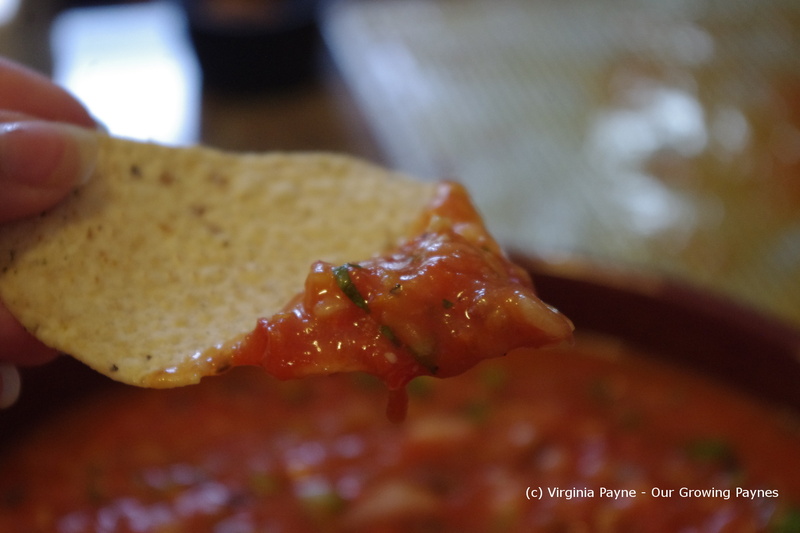 We like to have our salsa with lime flavoured tortilla chips. We also had some last night with tacos. It was pretty yummy! Can You Stand the Heat? Hot Pepper Jelly Coming Right Up! I had a fabulous day with my husband in the kitchen. Every once in awhile we’ll just make a bunch of stuff which means good things for upcoming posts! 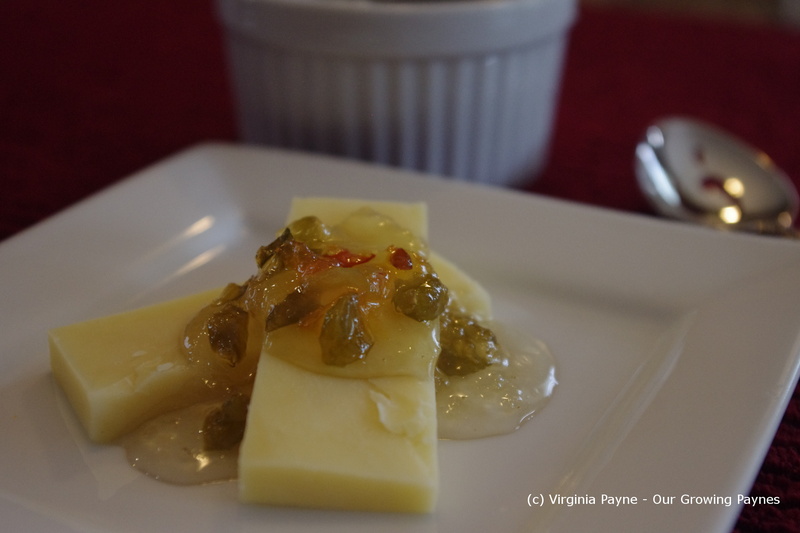 The first thing we made was hot pepper jelly. It’s that time of year where our peppers are bursting with hot and sweet. And it is also a jelly that is very easy and fast to make. The recipe calls for mostly sweet peppers but as this is supposed to be hot pepper jelly I ignore that and just make sure I have 4 cups total of peppers. The guide I use came from allrecipes.com. It only called for 1/4 cup of hot peppers! You have to have some zing in this. I grabbed poblano, hot wax, and jalapeno peppers as well as a few bell peppers. I chopped them and then let them drain for a bit. You don’t want this overly watery. 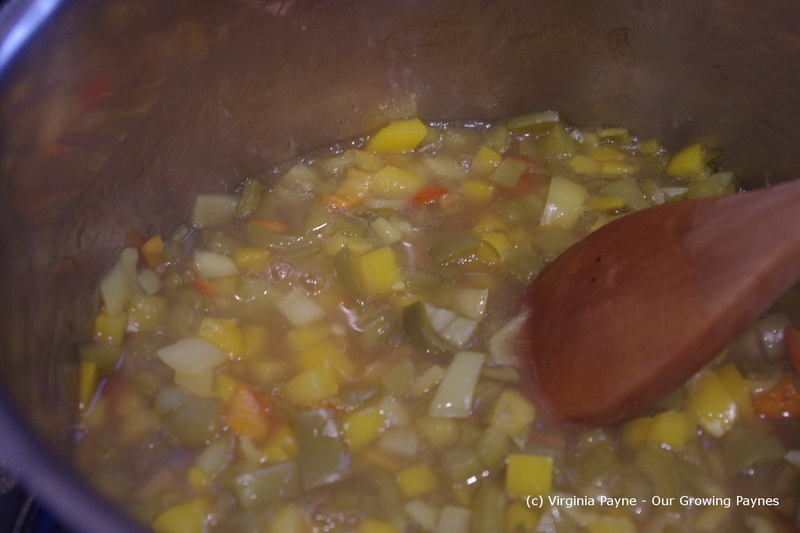 In a saucepan add the peppers, 1 cup apple cider vinegar, and 1.5 oz of pectin. 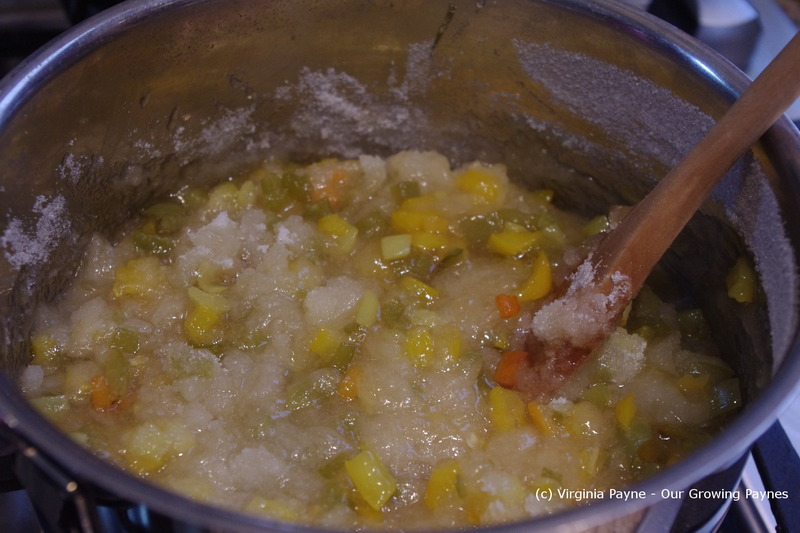 As you cook this if you need more pectin add a bit more. I found this amount to work for these peppers. Stir well then bring to a simmer. I have it simmer while the water for the jars is coming to a boil. 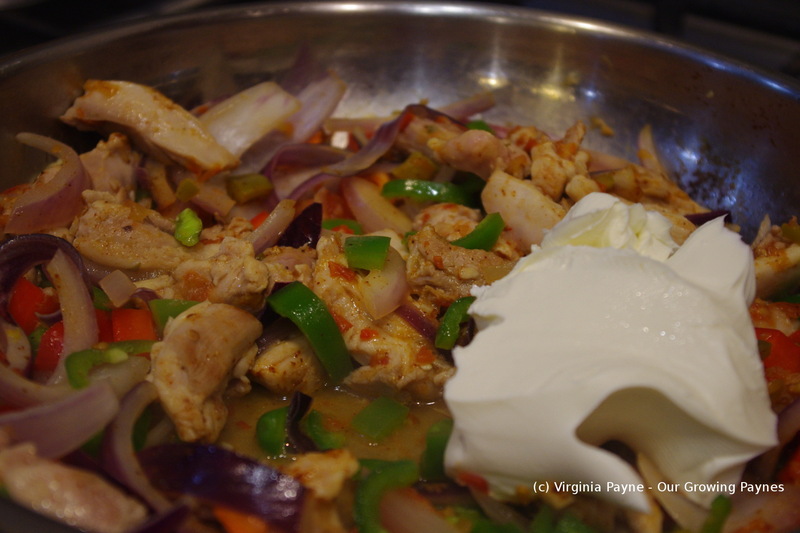 It allows the flavours of the peppers to come out nicely. Bring it to a boil then add 5 cups of sugar. Sounds like an insane amount doesn’t it. But it works. But because of all the sugar I definitely want some heat to come through with the hot peppers. Keep stirring as the sugar blends in. Then bring it to a boil for about a minute or so. Can in the jars after you sterelise them. Then boil for 5 minutes. Allow to cool. It is lovely on some nice aged cheddar.